YOUR HOME MAY BE YOUR SINGLE BIGGEST INVESTMENT AND ONE OF THE LARGEST FINANCIAL TRANSACTIONS YOU’LL EVER MAKE. When selling, you want the best price and most favorable terms. There are a myriad of marketing options, legalities and details that go into a sale, from the time you set the price to closing. It takes a lot more than adding it to the MLS listings and putting a sign in the front yard. We have a full marketing plan we prepare for our selling clients to save them time and trouble – and to ensure that their homes sell as quickly as possible, and at top value! When we market your property, you benefit by receiving our customized approach, tailored just for you. We assist you in all aspects of print and online marketing, from preparing your house to sell to advertising and handling the final details of the selling process. Feel free to explore our website with the many Seller Resources we have provided for our Home Selling Clients including a complementary online Instant Home Valuation, Things to Consider before Selling Your House, 7 Seller Tips: Sell Faster, for More Money, an overview of a Home Selling Marketing Plan, an overview of the Home Selling Process, and Moving and Packing Tips. If we can be of any further assistance or if you would like to learn more about Team Beesley, feel free to contact us directly at 831.204.3188. Selling your Monterey Peninsula house takes a lot more than adding it to the MLS listings and putting a sign in the front yard. There are nine critical areas that must be addressed to ensure that you get the best result when selling your home. Take advantage of the 36 service steps that we do for our Seller clients to save them time and trouble – and to ensure that their homes sell as quickly as possible, and at top value! Below are the nine critical areas that we will discuss during your Listing Consultation. Each area includes multiple service steps which we will discuss in detail during our first meeting. To request a Listing Consultation, please fill out your information on our Contact Page and we will be in contact with you to set up an appointment at your convenience. Preparing Your House to SellWhen selling, you want the best price and most favorable terms. There are a myriad of marketing options and details that go into a sale, from the time you set the price to closing (AKA your celebration day). When marketing your property, if it is properly prepared for showing an interested buyer, it will bring the best price, terms…and ultimately sell in the shortest time frame. Once your home is ready to show, we will begin marketing it to potential buyers and other sales associates. If possible, leave the home when buyers are present so they feel comfortable asking their agent candid questions. Turn on enough lights so the home is well-lit. Remove clutter from tables and bookshelves. Neatness makes rooms seem larger. Light a fire in the fireplace to create a cozy atmosphere. Keep money and other valuables, as well as prescription drugs, out of sight. Once you’ve found the home you want to buy, together we’ll complete a purchase and sale agreement. This is the contract in which you and the seller outline the details of the property transfer. When you’re ready to complete a purchase and sale agreement on a home, your offer will generally be contingent on a professional inspection of the entire property, including improvements. The home inspector looks beyond the cosmetics to make sure that the home’s general systems operate properly. The inspector will also look for large repairs that are needed and report on the condition of the home. The standard home inspector’s report will review the conditions of the home’s heating and cooling system, interior plumbing and electrical systems; the roof, attic and visible insulation; walls, ceilings, floors, windows and doors; foundation, basement and visible structure. The inspector will also look for cracks in cement walls, water stains that indicate leakage and any indication of wood rot. A home inspection also points out the positive aspects of a home, as well as the maintenance that will be necessary to keep it in good shape. As your agent, I’m familiar with home inspection services and can provide you with a list of names from which to choose. Another good source for finding a home inspector is to ask a friend, or perhaps a business acquaintance, who has had a home inspection and can recommend a home inspector they were satisfied with. Remember, no home is perfect. 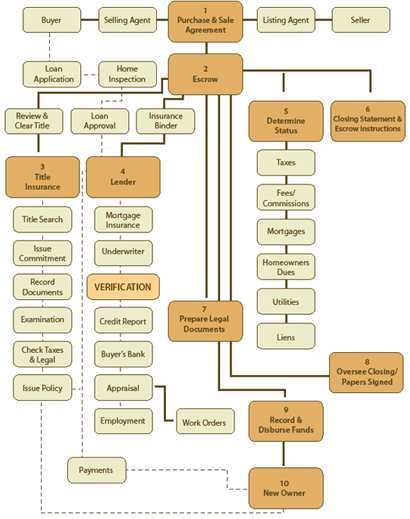 If problems are found, I will help you negotiate through the process. During the negotiation stage of the transaction, a mutually agreed-upon date for closing is determined. “Closing” is when you and the buyer sign all the paperwork and pay your share of the settlement fees, and the documents are recorded. Settlement obligations vary widely due to specific contract language, local laws and customs. Repairs or inspections seller has agreed to pay for.